From Hershey's and Snickers to Milky Way, Three Musketeers, and more, candy bars have long been a refreshing retreat from the worries of life. Unfortunately, it can become expensive purchasing these items at retail stores or out of vending machines. 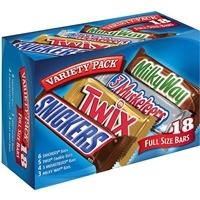 If you are looking for a way to get the most for your money, consider bulk candy wholesale. From giant candy bars to large bags of individually packed fun sized versions, we have a number of options you can choose from. Imagine receiving hours of sugary delight for the same cost as a single candy bar from a retail store. Wholesale bulk candy is a great way to enjoy the finer things in life without having to worry about the cost. Our staff has developed working relationships with the most popular candy bar companies, and we use our contacts to help you get the most for your money. Our wholesale chocolate bars are conveniently listed on our website, and it only takes a quick search to find what you are looking for. 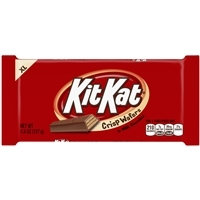 With online capability, getting wholesale candy bars from our location to yours has never been easier. Roasted nuts and a chewy center covered in rich chocolate. Big taste in a little bite! Giant Jawbreakers with gum filled center, in a cool shark wrapper! Ring Pop Gummies! The first gummy you can WEAR and EAT! Classic delicious and sophisticated chocolate bar. Available in milk or dark chocolate and now Peanut Butter. Snickers snack size mini candy bars. There are 90 wrapped fun size Snickers in each plastic jar. Buttery toffee covered in delicious milk chocolate, this bar is a distinctively rich treat. Use it in your holiday recipes for really decadent baked goods. Made with chocolate, pretzels, caramel, peanuts and peanut butter. Crunchy peanut better in a rich, chocolately coating. Crunchy peanut butter candy, covered in a layer of Reese's peanut butter, chopped peanuts and coated in rich milk chocolate. Treat yourself to this crunchy peanut butter and toasted coconut bar. An English style toffee bar covered in milk chocolate. Variety pack of your M&M favorites! Great for fundraising!